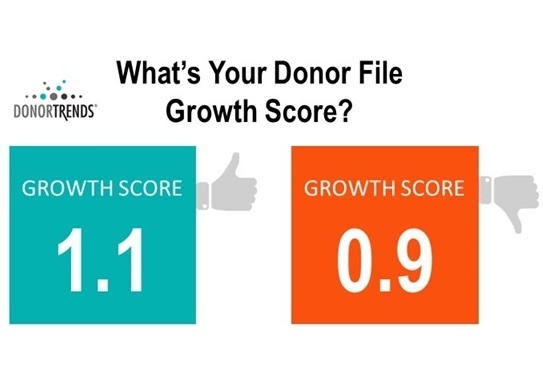 At DonorTrends donor file growth is expressed as a number we call the Growth Score. 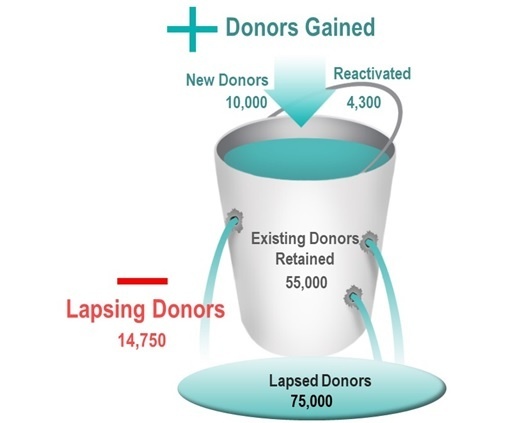 This simple metric evaluates the number of donors added to the file compared to the number of donors lapsing. If your Growth Score is more than 1, your donor file is growing. Less than 1, your file is shrinking. Did this organization’s donor file grow or shrink in FY18? The Growth Score is file is .97. The donor file size declined in FY18. Do you know if your donor file is growing or shrinking? To protect donor file size, set a goal for each of the statements below. Ensure that these goals have enough donors to cover the ones ‘leaking out’ of the bucket. I expect to acquire __________ new donors. I expect __________ new donors from last year to give a second gift this year [also called new donor conversion]. I expect __________ existing donors from last year to give again this year [also called existing donor retention – the water in the bucket]. Fight donor attrition by calculating your Growth Score and ‘Leaky Bucket’. And don’t forget to reach out to our DonorTrends team with any questions. Our advice is complimentary as is the calculation of your Donor Growth Score. Just contact us here.